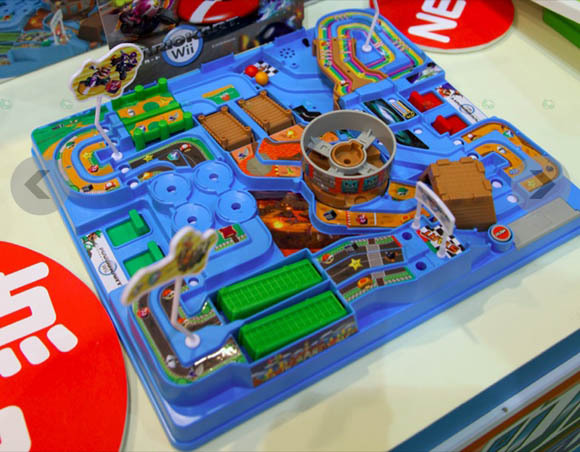 Inspired by the original SNES version of Super Mario Kart, the game’s board game counterpart recently made an appearance at the Tokyo Toy Show 2010, far from our own shores, but close enough to inspire a hardy “DO WANT!” to escape my lips. The idea is that two players each have a separate, parallel track around the board, and around this track you must shimmy and coax your �kart� (a plastic ball). First to the finish-line wins. The video of the game in action (non-embeddable, linked below) shows it to be way duller than that description makes it sound. First, there are far too many non-kart like tracks. It comes down, pretty much, to bashing buttons to make the ball hop to the next section. On the upside, the board does contain sound FX from the original video game. So even if the actual gaming might fall flat, this is a pretty cool centerpiece for, say, your living room table, perhaps even Thanksgiving dinner? Just an idea.